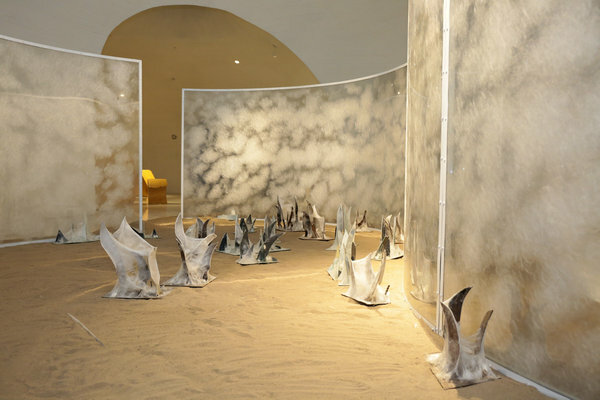 Beijing's renowned contemporary art institution UCCA opened its first branch the Dune Art Museum facing the Bohai sea at the Beidaihe resort in Hebei province, with the inaugural show After Nature featuring works on nature and humans on Oct 13. 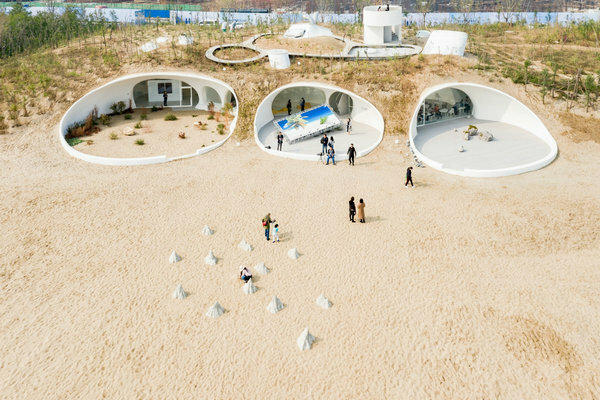 Beijing's landmark art institution, the Ullens Center for Contemporary Art, opened its first branch the Dune Art Museum, an art gallery built "inside a sand dune" on the beach at the Beidaihe resort in North China's Hebei province, and its inaugural exhibition After Nature was unveiled on Oct 13. The art museum, facing the Bohai Sea, comprises three outdoor and seven indoor galleries, all of which are connected like a string of caves of different sizes and shapes. The exterior of the museum is covered by sand and local plants, hiding the white building in the dune. The opening show focuses on nature and features photos, videos and installations by nine Chinese artists from different generations who discuss the relationship between nature and humanity. Speaking about the new museum, Philip Tinari, the director of UCCA, says this is the first time that the nonprofit art institution has set up such a gallery. The museum in Beidaihe, on the outskirts of Qinhuangdao－a popular summer retreat for people living in the northern cities, especially Beijing and Tianjin－is supported and owned by the Aranya Gold Coast Community, a tourism project in the area with lots of structures, including a library on the beach and a church. The UCCA will hold exhibitions at the museum and will curate at least two shows every year, under a five-year contract with Aranya, says Tinari. "It (the museum) is in the right location and in the right building. And as it is very close to Beijing, we can offer our services, " says the director of UCCA, a well-known art institution focusing on contemporary art and founded by the Belgian collector Guy Ullens in 2007. Meanwhile, the art center was sold by Ullens and his wife, Myriam, known for their huge collection of Chinese art, to a group of Chinese last year. Although the ownership of the center has changed hand, the brand still enjoys a good reputation due to its shows featuring star artists from home and abroad. Speaking about the dune museum, which has no collection of its own, and is used as an exhibition space, Tinari says: "It's like another gallery of UCCA. And we're pretty excited about developing the new model to see how it will work. "We're open to more opportunities in the future." UCCA is in charge of all the things related to the preparations of the shows, while the museum is owned by the Aranya community founder Ma Yin, who set up the project comprising private mansions, hotels and cultural sites, five years ago. The museum took about 18 months to complete, but the idea to build it was proposed at least three years ago, according to Ma. This kind of cooperation on art museums is seen as a new model for China as it seeks to keep up with the demand for more such institutions. Last year, the London-based Victoria&Albert Museum opened a design museum in the Chinese city of Shenzhen and the Pompidou Center in Paris, which houses the world's second-largest collection of modern art, is reported to be planning to set up a franchise gallery in Shanghai in 2020.